The European new-car market grew by 11.5% in August compared to a year earlier, reports JATO Dynamics, the world’s leading provider of automotive intelligence. The market grew by 8.9% year-to-date compared to 2014. 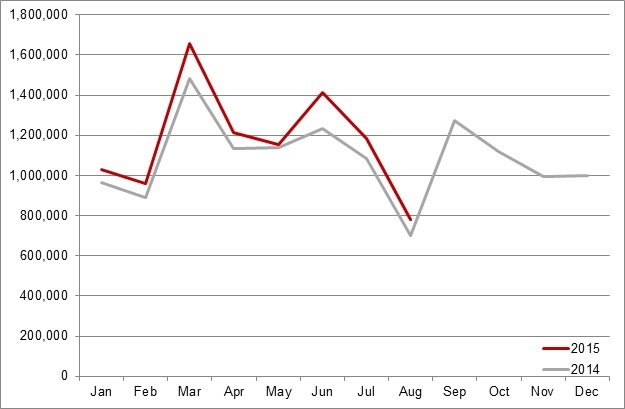 The European new-car market recorded growth of 11.5%, the third time this year, double-digit growth has been achieved. Germany increased sales by over 13,000 units compared to August 2014, while Spain achieved over 11,000 more units registered. Cyprus, the Czech Republic, Ireland and Slovakia also recorded year-on-year growth for the month of more than 30%. Brian Walters, Vice President of Data at JATO Dynamics, commented “Despite August traditionally being the slowest month of the year for car sales in Europe due to summer holidays, the market has achieved considerable growth compared to last year”. Volkswagen maintained its position as Europe’s leading car brand despite losing some market share. Ford took second position in August, ahead of Opel/Vauxhall and Renault, while BMW achieved fifth place, just ahead of its premium competitors Mercedes-Benz and Audi. All of the top ten brands recorded increased sales in August and the year-to-date. Outside the top ten, Nissan recorded the greatest rise in units sold compared to August 2014 due to the introduction of the Pulsar and the success of the new generations of the Qashqai and X-Trail, while Citroën also benefitted from stronger demand for the C3, C4 Cactus and C1 models. Volkswagen’s Passat increased sales by 44.4% to take fourth place, leaving Volkswagen with three of the five top models in August. Renault’s Clio took second place while Skoda’s Octavia was fifth. Skoda’s new Fabia also had an impressive month, where it recorded 37.7% more sales than its predecessor a year ago to enter the top ten for August. With the Octavia holding fifth place, this is the first time that two Skoda models have appeared in the top ten. Beyond the top ten, the Opel/Vauxhall Mokka continues to be popular with consumers with August sales up 53.3% on last year, putting it just ahead of its closest small-crossover competitor, the Renault Captur. The new generations of Mercedes-Benz C-Class, Peugeot 308 and Ford Mondeo also continue to make sales gains. For more information email jatoteam@firstlightpr.com, visit www.jato.com and follow JATO on LinkedIn & Twitter.